Lofting the last in the line of Progress M-M spacecraft, Soyuz U thundered off under the power of its four boosters and core stage, embarking on a nine-minute ride into orbit. The boosters operated for two minutes, separating from the launcher that continued onward powered by the core stage alone which fired for nearly five minutes, departing the Soyuz in the traditional hot-staging sequence. Taking over for a burn of almost four minutes, the third stage successfully placed the spacecraft in its targeted Low Earth orbit from where the Progress can catch up with ISS. Sticking to the express mission profile, the Progress will conduct four orbit-raising maneuvers in the first three hours of the mission followed by the initiation of the fully automated rendezvous sequence that will bring the Progress to the direct vicinity of ISS for a flyaround to set up for docking to the Zvezda module at 22:54 UTC to mark the on-time delivery of 2,369 Kilograms of cargo. 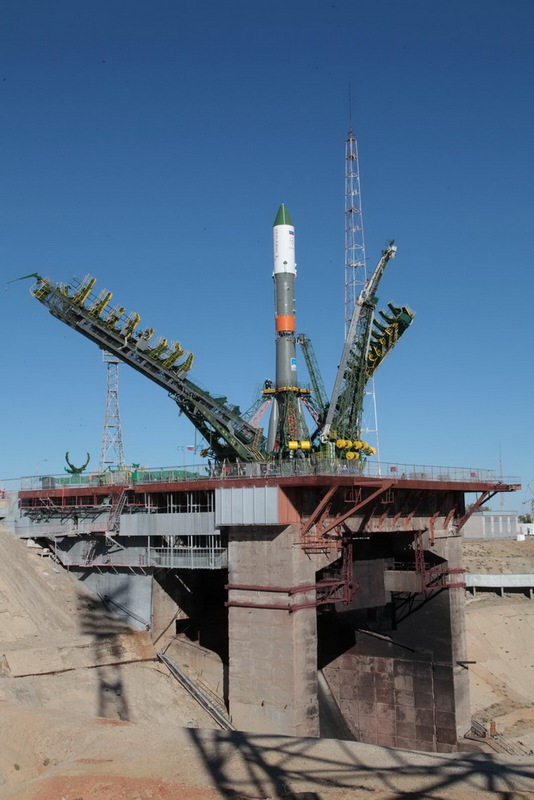 After Tuesday’s rollout of the 51-meter tall launch vehicle to the historic Site 1/5 at the Baikonur Cosmodrome, the rocket entered a detailed testing campaign that exercised all subsystems to verify all were in readiness for the launch. The L-2 processing campaign that puts Soyuz through detailed checkouts and prepares the booster for tanking can be considered routine in the well-oiled machine of Soyuz launch operations at Baikonur. Teams initiated the lengthy launch countdown at L-8 hours, heading into the evening at the Cosmodrome. Technicians spent the first hours of the countdown working on the Soyuz launcher to remove protective covers including those on the booster and core stage engines. Also, the flight batteries were installed on the rocket and the final preparatory steps for propellant loading were taken as the Propellant Cars rolled up to the pad and were connected to propellant handling systems. 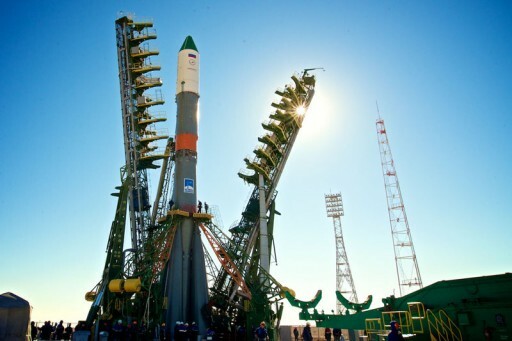 Soyuz and Progress were powered up to head into the next round of testing operations to set up for the critical reconfigurations made to the rocket and spacecraft in the later stages of the count. Five hours prior to liftoff, the Russian State Commission met for the last time to review the results of launch vehicle testing and check the status of the countdown to give the green light for propellant loading operations. 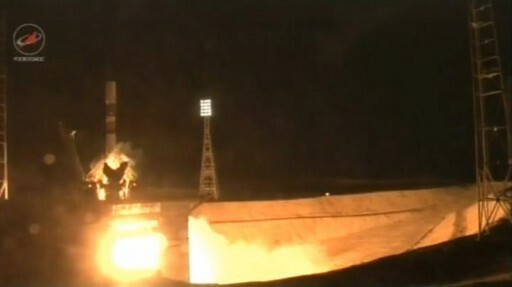 With no outstanding items, the State Commission approved Soyuz for tanking and a GO was relayed to the team at the pad to put in motion the two-hour tanking sequence when clocks entered L-4 hours. Propellant loading started with a brief chilldown of the Liquid Oxygen ground system and the tanks of the rocket before the -183°C oxidizer began flowing into the Soyuz. Over the course of two hours, Soyuz was loaded with a total of 274,200 Kilograms of Kerosene and LOX plus Nitrogen that was filled into spherical tanks on the boosters and core stage to be heated up in flight to act as a tank pressurization gas. Telemetry checks and systems reconfigurations on the Soyuz and Progress continued while tanking was underway to set up for the final hour of the countdown. When Kerosene was fully loaded and LOX/LN2 entered replenish, the tanking cars were disconnected and pulled to a safe distance to the pad to enable the team to press into the final set of close outs, removing access platforms to the Soyuz and setting up for the retraction of the Service Structure. Its exterior iced over due to the supercold LOX inside its propellant tanks, Soyuz U was revealed 45 minutes ahead of launch when the two halves of the Service Structure were retracted to their launch position to clear the way for liftoff. Guidance System activation and flight parameter load was completed by the team inside the Launch Bunker while teams above ground began the evacuation of the launch complex. Launch Command Power was activated half an hour before launch and the Progress spacecraft made its switch to battery power when countdown clocks were showing 15 minutes. 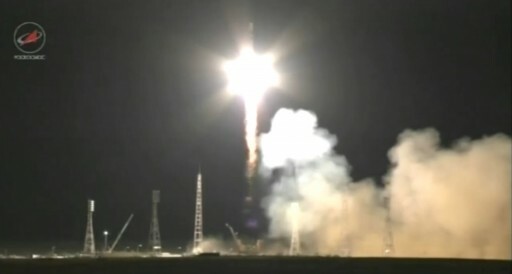 Next was the final status check of launch controllers at L-10 minutes, clearing the Soyuz for liftoff followed by a check with the Baikonur Range that verified clearance for launch. The Soyuz transitioned its guidance system to flight mode and entered the highly choreographed Automated Countdown Sequence at T-6 minutes. 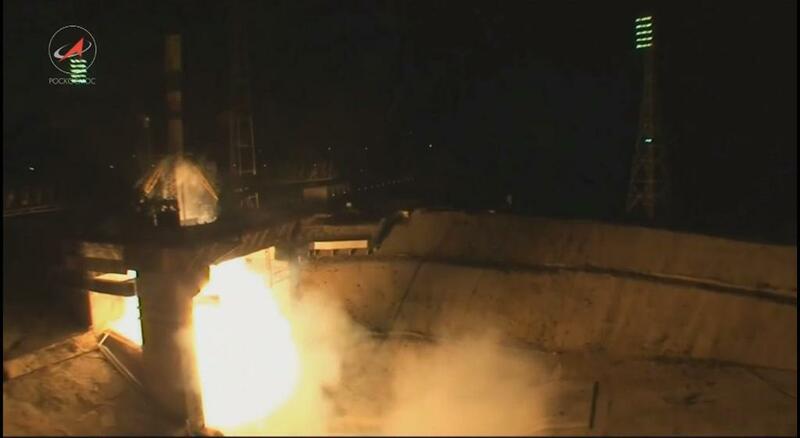 Authorization for launch was signaled by the insertion of the launch key inside the launch bunker. Soyuz transitioned telemetry system to flight mode at T-5 minutes and ground telemetry systems and recorders were started up as well. Purge flow to the booster and core stage engines began at T-4 minutes to remove any combustible substances from the propulsion system to ensure a controlled ignition of the engines. The 12 tanks of the Soyuz closed fill & drain valves as well as safety valves to begin the process of pressurizing for flight inside three minutes to launch. Soyuz switched to battery power and assumed control of its countdown at the T-1-minute mark, separating the payload and third stage umbilical for retraction of the umbilical tower at T-40 seconds followed by the Core Stage umbilical 20 seconds later. The Launch Command was issued at T-20 seconds, commanding the hydrogen-peroxide driven turbopumps of the RD-118 engine on the core stage and the RD-117 engines on the boosters to begin spinning up to flight speed. Soaring to life, the engines reached a preliminary thrust stage for a brief moment of monitoring before oxidizer valves were fully opened to enable the engines to ramp up to a collective liftoff thrust of 422 metric-tons. 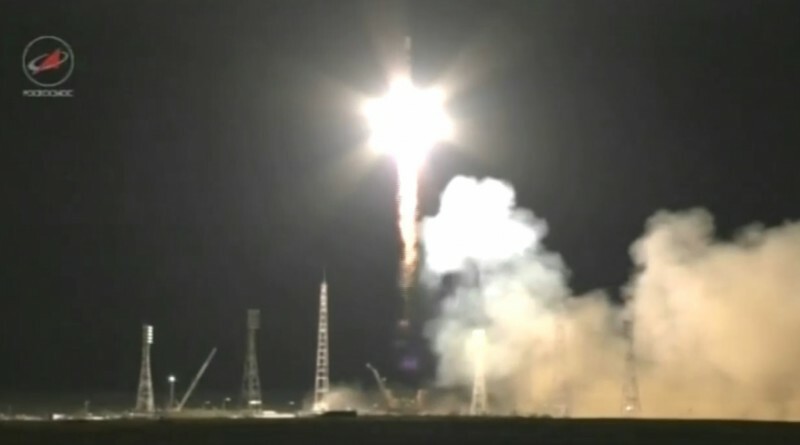 Overcoming hold-down weights, Soyuz sensed first motion and was on its way. Liftoff occurred at 16:49:40 UTC when Soyuz started rising from its historic launch pad that supported space launches for over five decades. Lighting up the night, Soyuz rumbled skyward under the power of its boosters and core stage that used their gimbaling vernier engines to balance the rocket in a vertical posture for the first ten seconds to set up for the pitch maneuver to place the vehicle on a departure path to the north-east. Consuming 1,600 Kilograms of propellant each second of flight, Soyuz started heading uphill and racing downrange, making its way to the Russian-Kazakh border. 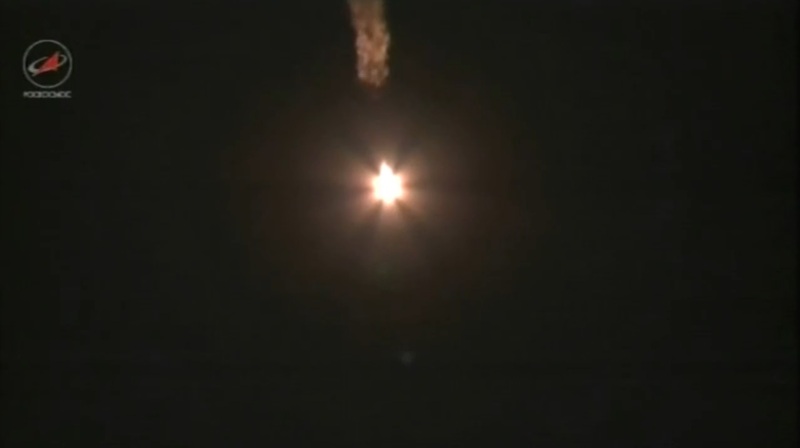 Soyuz broke the sound barrier followed by Maximum Dynamic Pressure a few seconds later, showing a nominal performance according to calls made in real time from the Launch Bunker. The four liquid-fueled boosters successfully completed their job after one minute and 58 seconds, helping accelerate the launch vehicle to a speed of nearly 1.5 Kilometers per second, doing most of the work during the initial ascent phase. The four 19.6-meter long boosters shut down their 1,021kN RD-117 engines after burning 39,600 Kilograms of propellants. Moments later, they were separated by pyrotechnics and pistons that pushed them outward to send them into a tumble back to Earth after making a clean separation without re-contact. The Soyuz continued its climb into orbit powered by the core stage’s RD-118 engine alone, delivering 102 metric ton-force of vacuum thrust and using its four verniers for three-axis stabilization. Call-outs made from the launch bunker indicated a good stabilization of the vehicle that flew right along the planned trajectory. 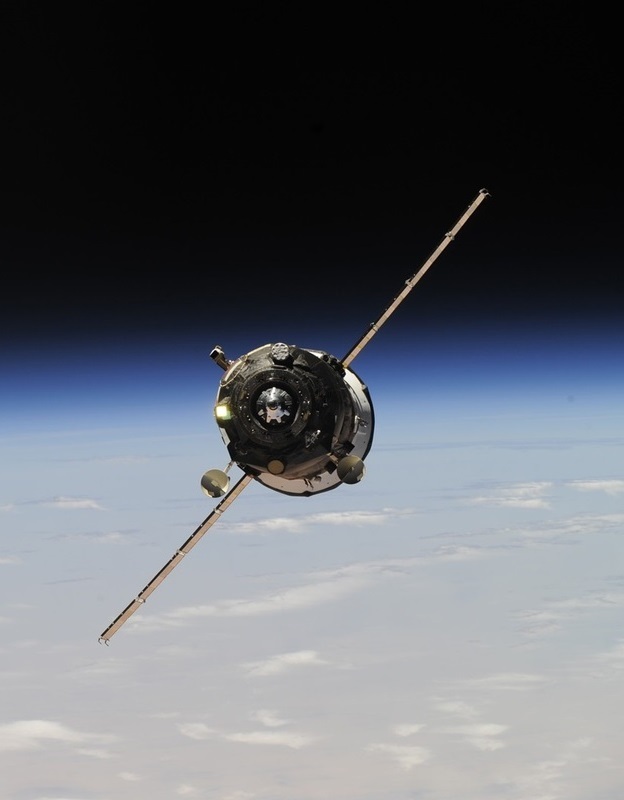 Two minutes and 41 seconds into the flight, Soyuz passed 85 Kilometers in altitude and separated the protective launch shroud as aerodynamic forces were no longer a danger to the Progress spacecraft. Jettisoning the shroud as early as possible increases the vehicle’s performance, no longer carrying the weight of the fairing. The 27.8-meter long Core Stage burned through over 90 metric tons of propellants to send the Progress on its way and was shut down four minutes and 45 seconds after liftoff followed moments later by the hot-staging sequence. The RD-0110 engine of the third stage was commanded to ignite and split seconds later, the separation pyros were fired to severe the mechanical connection in between the two stages, allowing the third stage to pull away from the spent core. The third stage of the rocket assumed control of the mission to finish the task of lifting Progress M-29M into orbit by making a burn of 3 minutes and 58 seconds with its engine delivering 30,400 Kilogram-force of thrust. Ten seconds into the third stage burn, the aft section panels were jettisoned to fully expose the engine compartment. Good reports came from the Launch Bunker throughout the burn of the third stage that performed flawlessly and remained on course. Progress M-29M was targeting an insertion orbit of 193 by 245 Kilometers at an inclination of 51.66 degrees at a phase angle to the ISS orbit around 30 degrees. A precise insertion was required for the Progress to be able to make its fast-track rendezvous as any large errors in the initial orbit would automatically result in a change to the longer 34-orbit trajectory. The third stage shut down its engine at T+8 minutes and 45 seconds after a seemingly flawless ascent mission. Four seconds later, the Progress spacecraft was released from the third stage, being sent on its way to the International Space Station. Subsequently, the Progress successfully unfurled its two power-generating solar arrays and deployed all KURS navigation antennas. KURS was then activated for a functional check while the spacecraft was still within range of Russian ground stations to verify the status of KURS as early as possible when there was still a safe path to back out of the fast rendezvous in case of problems with the navigation system. No issues were found the Progress departed ground station range after successfully priming its propulsion system and entering a stable attitude. As part of the four-orbit rendezvous, the Progress has to begin raising its obit right away with two burns that are performed during the first orbit. These burns were pre-planned based on the target insertion orbit and are performed regardless of the actual orbit. Parameters for the third and fourth burn will be modified based on tracking data to correct insertion errors and place Progress into the correct orbit for the start of the rendezvous sequence after the second orbit. The first orbit adjustment maneuver is expected to take place 46 minutes after launch with a planned duration of 61 seconds and a change in velocity of 24.2 meters per second. The Progress spacecraft uses a KTDU-80 propulsion module featuring the main propulsion system. It includes four spherical tanks that can hold up to 880 Kilograms of UMDH and N2O4 propellants. The S5.80 main engine can operate at three thrust levels. Nominal thrust is 300 Kilograms. The second maneuver will occur at T+81 minutes – a planned 51-second main propulsion system burn to increase the vehicle’s speed by 20.3 meters per second. When passing over Russian ground stations, the Progress will receive updated parameters for its upcoming rendezvous burns, computed based on the actual insertion orbit measured by radar stations after launch. Also as part of the ground pass, Progress completes more testing activities related to its control system and the KURS navigation system. The third DV burn is expected at 18:53 UTC to deliver the Progress to an orbit of 294 by 308 Kilometers followed 30 minutes later by the fourth main engine burn targeting an orbit of 298 by 331 Kilometers. The Automated rendezvous of the Progress will be initiated at 20:45 UTC. 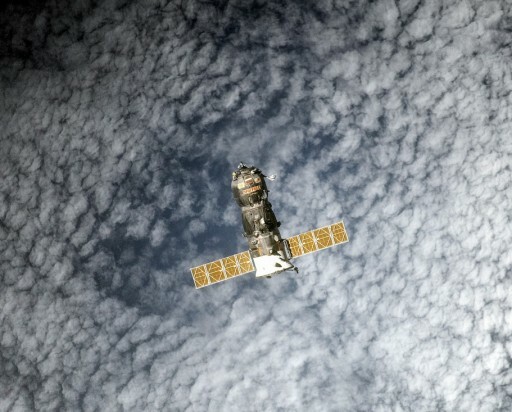 A pair of large DV maneuvers are part of the sequence to deliver the Progress to the vicinity of the Space Station. Once the Progress is about 200 Kilometers from ISS, the KURS A and P Systems on Progress and the Station are activated to start gathering relative navigation data to guide the Progress through more maneuvers to get closer to ISS and refine its path. At a range of 15 Kilometers, Progress will complete a KURS test to make sure navigation data provided by the system is valid. The TORU System will also be active and in standby mode. The Russian crew members aboard ISS will be supporting the Rendezvous and Docking by monitoring the vehicle and acquiring engineering footage. They will be standing by at the TORU Controls to assume manual control over the spacecraft should a problem with its navigation system arise. Inside 1 Kilometer to ISS, Progress will conduct a series of braking burns with the DPO thrusters of the vehicle to slow down ahead of the Flyaround that is initiated at a distance of 400 meters. The Flyaround is expected to begin at 22:32 UTC and take the Progress around the Station to line up with the Zvezda Module. Once aligned with the docking port, the vehicle enters a period of Stationkeeping at a distance of about 180 meters. Stopping is approach, Progress M-29M will go through a short alignment and systems check before the command to start the final approach is sent to the spacecraft. Once all verifications are complete, the Progress will be commanded to briefly fire its thrusters and initiate a slow closing rate to cover the final 180 meters, making its final approach to the Zvezda Module. Contact and Capture is planned at 22:54 UTC to mark the arrival of the Progress at the International Space Station just over six hours after its thundering liftoff. Following contact and capture, the docking probe of the Progress is retracted and latches are closed to establish a hard mate between the spacecraft and Zvezda. Leak checks and hatch opening will be performed later on Friday to mark the start of the docked mission of the Progress that will be just nine weeks in duration.